Harvey death toll increases as rising floodwaters leave thousands stranded. People walk through flooded streets during the aftermath of Hurricane Harvey on Sunday in Houston. Update at 6:20 p.m.: The reality of Hurricane Harvey—now a tropical storm—is proving to be far more devastating than even the direst predictions. Rising floodwaters are taking over large parts of Houston, turning streets into rivers that can only be crossed with a boat (or kayak). Meanwhile, many residents of the nation’s fourth-largest city were often left stranded, with nowhere to turn but the roofs of their homes waiting for overstretched emergency crews to lend a hand. “This will be a devastating disaster, probably the worst disaster the state’s seen,” William “Brock” Long, the new director of the Federal Emergency Management Agency, said. At least six people have died as a result of the flooding, but everyone expects that number to keep rising considering rescue workers have not been able to reach some of the worst-hit areas. The flooding in Houston was so extensive that officials couldn’t even say that one area was the worst affected. The National Weather Service made it clear that we were entering were uncharted territory, noting that the effects of Harvey are “unprecedented & all impacts are unknown & beyond anything experienced.” The one thing that seems certain is that things will get worse before they get better as some areas of Houston and its suburbs could receive as much as 50 inches of rain. “What we’re seeing is the most devastating flood event in Houston’s recorded history. We’re seeing levels of rainfall that are unprecedented,” said Steve Bowen, chief meteorologist at reinsurance firm Aon Benfield. More than 3,000 national state guard troops are being deployed to the area to assist with the recovery efforts as President Donald Trump plans to travel to Texas on Tuesday. At least five people have died in the Houston area in flood-related deaths, according to the National Weather Service. And the number is likely to rise considering many of the worst-hit areas remain inaccessible to rescuers and the flooding in the Houston area is expected to worsen. Hundreds of people were making desperate calls to 911 Sunday morning, hoping to be plucked away from rooftops. Early Sunday, Harris County officials estimated that some 1,000 water rescues had already taken place. 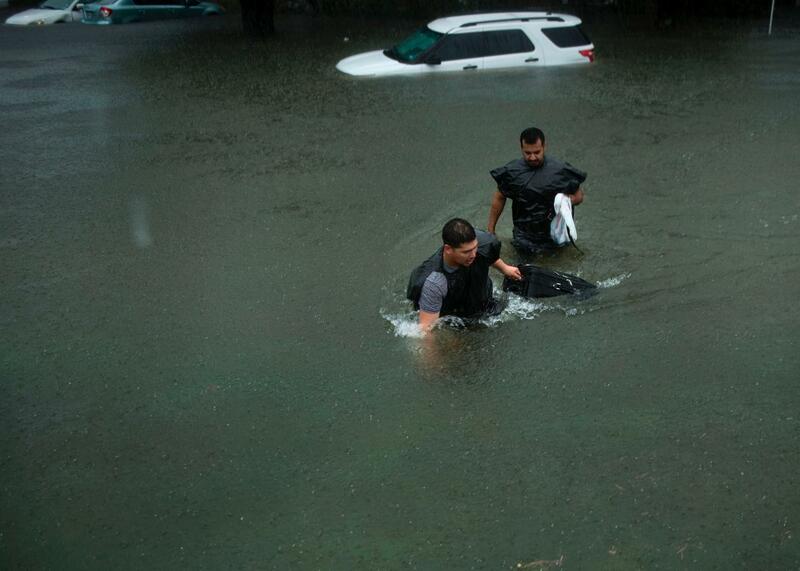 Houston police officers also evacuated two apartment complexes overnight. “It breaks your heart,” Houston Police Chief Art Acevedo said during a livestream on Twitter as he stood in waist-high water. “But it’s Texas. We’ll get through it.” Harvey is expected to continue slowly moving toward Houston through Wednesday. “The flooding is only going to get worse as we go forward,” said Michael Palmer, lead meteorologist at the Weather Channel. The Coast Guard was overwhelmed with requests for help as it carried out urban search and rescue operations in the greater Houston area on Sunday morning. “Currently there are five MH-65 Dolphin Helicopters conducting rescues,” the Coast Guard said. Officials are urging residents to stay put even if some water has entered their homes, and not to call emergency services unless it’s a life or death situation. “911 services at capacity. If u can shelter in place do so, a few inches in your home is not imminent danger. Only call if in imminent danger,” the city of Houston tweeted.